Is it true we’re going to be working with an American manufacturer to supply our Amtrykes? Yes! This exciting news was announced during Saturday’s General Session at the 2018 AMBUCS National Conference in Reno. Just prior to our conference, the National AMBUCS Board of Directors unanimously approved entering an agreement with Bicycle Corporation of America (BCA) to become our manufacturer and supplier for Amtrykes and related accessories. What information did the Board of Directors use in making this decision? The decision by the Board was made after receiving a recommendation from the Amtryke Advisory Board, which had previously received the full endorsement of the Amtryke Production Review Team. This ad hoc group was comprised of a dozen committed Ambucs (Physical and Occupational Therapists, Advisory Board Members, National AMBUCS Board Members, Amtryke Master Mechanics and ARC Administrative Staff) who spent several months representing our organization in meetings and discussions with BCA. The process included multiple visits to the factory in Manning, SC (Just a 3 ½ hour drive from the AMBUCS Resource Center in High Point, NC!) and a thorough review of six Amtryke prototypes created by the BCA team. We had the opportunity to test prototypes of AM-10, 1410 and 1412 models. BCA fabricated two versions of each model – one aluminum and one steel. In addition, BCA representatives spent an entire day at the AMBUCS Resource Center (ARC), observing actual Amtryke evaluations and fittings conducted by an Amtryke Evaluation and Fitting for Therapists (AEFT) certified therapist. Below is a list of people who served on this landmark review team. If you would like to reach out to any of them, they would be happy to share their impressions of BCA. Exactly who is Bicycle Corporation of America? 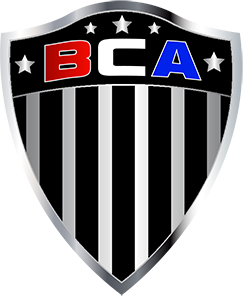 Bicycle Corporation of America (BCA) is a subsidiary of Kent International, which is headquartered in Parsippany, New Jersey. This 4th generation family bicycle company, started in 1906 as small bicycle shop in Manhattan. In the 1990’s, almost all American bicycle manufacturers moved their operations overseas or shut down completely. At that time, Kent International moved its operations to China, but in 2013 made a commitment to move part of the operation back to the U.S. Shortly thereafter, the BCA factory opened in Manning, SC They are currently producing more than half the bikes that are made in the United States and sold here. Arnold Kamler, Chairman and CEO of BCA and Kent International, was able to attend our Amtryke giveaway at National Conference. During the President’s Dinner at National Conference, newly elected National President Randy Cloud paid Arnold’s dues, making him an “official” AMBUCS member. To view a CBS News video about BCA and make a “virtual visit” to the factory in Manning, SC, just click on this video link. The information is slightly dated. The SC factory is now producing an average of 1,200 bikes per day – ranging from bikes that retail for less than $100 to $5,000 specialized carbon fiber bikes – and running two full production shifts with close to 170 employees. Does this mean our Amtrykes will now carry the “Made in USA” label? Good question. Not yet. 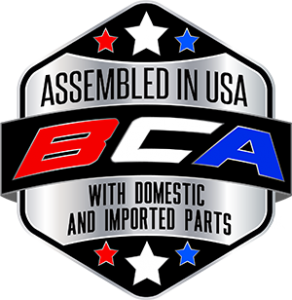 Initially our BCA Amtrykes will bear the label “Assembled in USA with Domestic and Foreign Parts.” This is due to the fact that some tryke components will be manufactured in other countries. 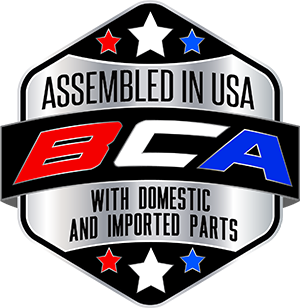 BCA’s ultimate goal, however, is for all Amtryke components to be manufactured in the United States and for our trykes to proudly display the “Made in USA” seal. Will the new BCA Amtrykes be available immediately? No. Patience will be required during this transition. It will take time to phase in an entire new fleet of BCA Amtrykes. We will continue to order from Gomier – our current manufacturer in Taiwan – for the next 12-18 months, while gradually introducing new BCA Amtrykes to our line-up. Before any new model goes to production, a working prototype will have to be designed, fabricated, and thoroughly reviewed and tested. Are Amtrykes going to be more expensive? No. We have been assured by Arnold Kamler (Chairman and CEO) that BCA will match or beat current Gomier prices. Will Amtryke models or designs change? If so, how? Most definitely. Just some of the changes currently being explored by BCA’s design team – working closely with key AMBUCS/Amtryke staff and volunteers – are lighter frames and accessories, simplified tryke assembly, increased adaptability, as well as standardization of parts and accessories. We’ll have more specifics to report as each new model is released. Will we be able to get Amtrykes faster? Unfortunately, you won’t see much of a change over the next few months, as we continue to order the majority of our trykes from Taiwan. Some challenges and delays are inherent to that process. We are so excited to say that after the transition we will be a vastly more nimble and efficient partner in helping you inspire mobility and independence. Is our agreement with BCA in writing, or is it a “handshake” agreement like we’ve had with Gomier in Taiwan? You will find a copy of the signed Memorandum of Understanding (MOU), which defines our working relationship with BCA, delineates each party’s responsibilities and protects our interests going forward, here. These are exciting times for our organization! Still, we ask for your continued patience during this monumental transition.